In recent years Georgia has undergone considerable development and as a result has moved its Parliament from the capital Tbilisi to the city of Kutaisi, a city which is also home to a large university and student population. Following the cessation of heavy industry exports to Russia, the city experienced a difficult economic period. The Government of Georgia therefore decided to actively undertake an extensive regeneration of Kutaisi, not least by relocating the country’s seat of parliament and building a new international airport; an airport which also provides access to region to the growing numbers of tourists who have recently been discovering this young state in the Caucasus. The government of Georgia additionally wanted to reduce the cost of flights to the region, thereby not only making the city more accessible for tourists, but also for the students of Kutaisi University. Kutaisi International Airport is therefore designed to serve domestic and international flights for use by tourists, students, national politicians and international diplomats. Specific attention was paid in the design to the experience of the traveller. The more typical pre-flight ‘conveyor belt’ experience of the passenger typically pays little regard to the joy of travelling, to the social and experiential component of travel. The design for Kutaisi International Airport aims to replace this sense of mechanisation with the reintroduction of a sense of joy in the travel experience. The architecture of the terminal refers to a gateway, in which a clear structural layout creates an all-encompassing and protective volume. Both the exterior corner detail – which functions as a crossing-point and point of recognition – and the so called umbrella structure within the terminal building – which operates as a roundabout for passenger flows – operate as the two main architectural details around which all of the airport functions are organised. The umbrella further guarantees views from the terminal plaza to the apron and to the Caucasus on the horizon and vice versa. The central point in the umbrella is an exterior patio which is used for departing passengers. The transparent space around this central area is designed to ensure that flows of passengers are smooth and that departure and arrival flows do not coincide. The design organises the logistical processes, provides optimal security and ensures that the traveller has sufficient space to circulate comfortably. Serving as a lobby to Georgia, the terminal will in addition operate as a café and art gallery, displaying works by young Georgian artists and thereby presenting a further identifier of contemporary Georgian culture. The 55m high Air Traffic Control Tower and its supporting office/operational building is designed to complement the design of the terminal. The tower’s strong appearance makes it a beacon of the airport and surrounding area. The traffic control cabin on the top level forms the focal point of the tower, with a 360 degrees view on the surrounding landscape. A spacious and comfortable interior ensures a workspace for 4-8 operators with optimal concentration. The exterior of the tower is clad with a perforated skin on a concrete core to use wind for ventilation purposes. LED Light in-between the skin and the core enhance the beacon effect of the tower at dusk and dawn by changing colour whenever there is a fluctuation in wind speed. This interactive element thus creates a visual sense of recognition and a feeling of ‘coming home’ for both travelers and those returning to the city respectively. The design for the new airport incorporates numerous sustainable elements. The previous structure of an existing office building has been reused. A large onsite underground source of natural water provides the basis for the reduction of energy consumption through concrete core activation and use for sprinkler basins. The floors of both the terminal and the traffic control tower will utilise this water for maintaining a regulated temperature in the two volumes. In the terminal building cantilevered roofs provide sun shading on south and southwest zones. A hybrid low pressure ventilation system is integrated into the terminal’s main structure and there is a grey water collection system in the floor underneath the terminal building. A future aim is to present Kutaisi airport as Georgia’s first airport to incorporate a strict segregation of waste and establish a recycling system which could be further implemented into new and existing projects in Georgia. The project was designed and constructed in two years, under lead consultancy of UNStudio, with the airport already having begun operations by September 2012. Both design and construction saw the involvement of numerous local and international companies, with openness and knowledge sharing proving to be essential to fulfilling the tight schedule. The steel structure of the terminal – produced and shipped from Hungary – recently won a European Steel Design Award. Kutaisi International Airport will become a central hub, with up to one million travelers targeted in 2014-2015. Actual figures for the airport show 30 flights per week increasing in spring 2014 to 40, by which time direct flights from Western Europe to Kutaisi will also be possible. Client: Air Traffic Control Tower, offices and meteorological building: Sakaeronavigatsia Ltd.
UNStudio’s design for the new Transfer Terminal and Air Traffic Control Tower for Kutaisi Airport was officially presented yesterday by the President of Georgia, Mikheil Saakashvili. UNStudio has designed the new Kutaisi Airport which will serve domestic and international flights for use by international diplomats, national politicians and for tourism. Georgia, a young state in the Caucasus which has undergone considerable development in recent years, is moving its Parliament from the capital Tbilisi to the city of Kutaisi. A new parliament building is currently under construction in Kutaisi and in 2012 the first parliamentary meeting will take place. In recent years growing numbers of tourists have been discovering Georgia, a country with an ancient and engaging history. As a result there is increasing demand from airlines to fly to Georgia. By virtue of its geographical advantages and the nearby location of two of Georgia’s most important Unesco monuments, Kutaisi was selected as the destination for a new airport. 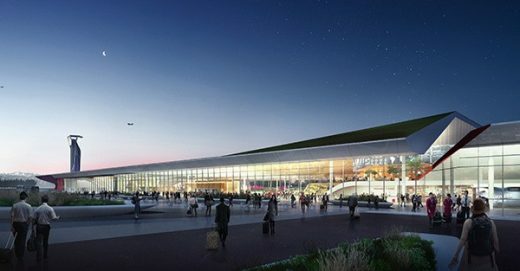 The new Kutaisi airport will in addition provide an economic impulse to Georgia’s second city and its new seat of Parliament. UNStudio’s design for the new Kutaisi Airport incorporates both Georgia’s historic landscape and its architecture. In Georgia public buildings and private houses employ their entrance lobbies as showcases for their individual identities. In the design for the new airport UNStudio embraces this architectural concept in order to manifest Georgia’s young and dynamic democracy, along with its rapid development as a main crossing point in the region. Georgia is located on a crossroads of rich cultures, with a history of travellers passing through the Caucasus or arriving from the Black Sea. The 4,000 m2 terminal building will house a central arrivals hall, a check-in area with lounge, cafe and car rental facilities, three gates for departure with retail, cafes, a CIP lounge area and exterior garden, an arrival area with customs and offices for the border police and an administration area with staff rooms and press conference facilities. The architecture of the terminal refers to a pavilion; a gateway, in which a clear structural layout creates an all encompassing and protective volume. The volume is structured around a central exterior space which is used for departing passengers. The transparent space around this central point is designed to ensure that flows of passengers are smooth and that departure and arrival flows do not coincide. These axes incorporate views from the plaza to the apron and to the Caucasus on the horizon. The design organises the logistical processes, provides optimal security and ensures that the traveler has sufficient space to circulate comfortably. Serving as a lobby to Georgia, the terminal could in addition operate as an art gallery, displaying works by Georgian artists and thereby presenting a further identifier of contemporary Georgian culture. The 55m high, 300 m2 Air Traffic Control Tower is designed to compliment the design of the terminal. The traffic control cabin on the top level forms the focal point of the tower, with a spacious and comfortable interior ensuring a workspace of optimal concentration. 1,500 m2 of supporting office spaces are housed in a nearby building. The exterior of the tower is clad with a transparent skin with the potential to change color whenever there is a fluctuation in traffic. The Air Traffic Control Tower will function as a light beacon to the sky for the international airport, but also from the road to and from Georgia’s new parliamentary city Kutaisi. The design for the new airport aims to incorporate local and international sustainable elements. An onsite underground source of natural water provides the basis for the reduction of energy consumption through concrete core activation. The floors of both the Terminal and the ATCT will utilise this water for maintaining a regulated temperature in the two volumes. In the Terminal building cantilevered roofs provide sun shading on south and southwest zones. A hybrid low pressure ventilation system will be integrated into the terminal’s main structure and there will be a grey water collection system in the floor underneath the terminal building. To further lower energy consumption there is the possibility to implement large areas of PV-cells on the roof surface. Kustaisi airport will be Georgia’s first airport to incorporate a strict segregation of waste. The aim is to establish a recycling system which could be further implemented into new and existing projects in Georgia. Construction on the new Kutaisi Airport will begin in December 2011. The airport is scheduled to be operational in September 2012. Client Air Traffic Control Tower and Offices: SAKAERONAVIGATSIA Ltd. Height Air Traffic Control Tower: 55m.